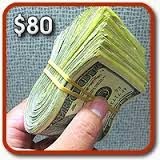 What would you do with $80 right now? Would you buy something that makes you smile, pay a bill, save it, give it away, or just sit with it for a few days. The value of eighty dollars has changes quite a bit over the years, but that's just relative to who you are and how you see it anyway. Some people make $80 in one week, some in one day, some in 1 minute. I could talk to 100 people and they would probably give me 100 different answers. This is how it goes, we are all different. So I thought back to when I was a young boy. Back then, not too long ago, twenty dollars make me very excited. I could buy candy, or video game plays, or a few books, or some comic, and the list goes on. I really could make it go a long way no matter what. But what I remember about that time, is that I never really needed money for anything. I mean things did cost money, however, I was well taken care of through my parents and they made me work for extra money and it was never any different. I am so thankful for that today. Well, I have taken the long way around the pond to arrive at my real story. As I was walking down the street about 1 hour ago, I found $80 rolled up in a bunch. I was on the phone when I spotted it. Now, I am the kind of walker that notices many things on the ground in a second. I could write multiple posts on finding things for sure! My immediate thought was that if anyone even hinted at loosing the money in the near vicinity, I would give it right back to them. I looked in both directions and there was no one there. In my gut, I wanted to give it back more than I wanted to keep it. I immediately switched to thinking, if this was me that lost $80, I would want it back without a doubt. I continued my call and told my good friend on the line what had happened. Then I felt a wave of abundance coming over me. I equated this finding to abundance and more of it giving me a signal. Incidentally, last week, I also found $80 in my jacket pocket. This was a jacket that I wear while performing. I believe that I just broke a $100 bill several weeks back and forgot about it. Either way, I had shut it out of my mind and it reappeared. Coincidence? I think not. I thanked the universe and let it know promptly that I receive its gifts graciously and that I welcome all abundance that is on the way in all forms. I also agree to help others if the chance arrives. My next thought was, how could I give back a little bit with this money? Then I told myself that it would be fun to do it in an interesting way, like paying for the person behind me at a coffee place or at a toll, or buying the lunch for some people who are just innocently in a cafe. But then it hit me! Many times in life we are just supposed to receive gracefully. There is no need for statements like, "You didn't have to, or You shouldn't have, or That's not necessary." These kinds of sentences can block blessings and gifts that we may deserve on some level. I used to have a lot harder time receiving because I was giving so much that I cancelled myself out in a sense. I just felt that my joy was at such a heightened level, that I was happy enough to just give. I still received many things, I then just became very grateful for so many more things. The circle of life includes giving and receiving and that will never change. If you are asked if you prefer to give or receive, just say both. Cover your bases because life is full of magic.